"My beloved, Mimimo no Toji, I only saw you once, but from that moment I have thought of you ceaselessly." Animator/puppeteer Kihachiro Kawamoto has spent more than 50 years working in film, producing a small collection of striking and beautiful animated films. 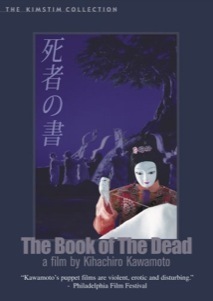 This disc presents his second full length feature, the mysterious and haunting The Book of the Dead, derived from the novel by Shinobu Orikuchi. This disc is one of two Kawamoto releases from KimStim/Kino, the other being a disc of the director's short films. Both are highly recommended. The film weaves threads of story around one character, the Lady Iratsume, a noblewoman. Iratsume spends her days in solitude, studying the Buddhist religion. She glimpses a vision of a figure in the mountains and believes it to be the Buddha. She leaves to find her vision at the mountain, but instead enters a temple forbidden to women. An old wise woman tells her the story of who the vision actually was: Prince Otsu, who was executed many years before. The pair become linked by their twin obsessions, he of the living world and she of the spiritual. Kawamoto has commented in interviews that he made the film in order to try and effect some soothing of the spirits of the innocent dead killed in recent warfare. In Buddhism, there is the belief that the souls of those who have died, be they friend or enemy, must be relieved, and hence the idea behind the film. Without some knowledge of this though, the film sometimes comes across as fairly oblique at times, and the sudden end may surprise those used to more conventional closure. The design of the film is one of its highlights; the puppets are quite beautiful and more expressive than you might expect, and the costumes are even more impressive, with great detail and color. The Japanese voice acting is good, and the English narration suits the film as well, although an option with the original Japanese narration would have been nice (assuming there is such a version). The story meanders occasionally, with one subplot involving a relative of Iratsume who wants to court her going absolutely nowhere. As with the other Kawamoto disc from Kino, this would have benefited from some contextual material, but just having the film at all is a triumph in and of itself. Image Transfer Review: The film is presented in its original 1.33:1 ratio, and as such looks fine. Though an interlaced transfer, I noticed no obvious defects such as combing. Colors are fairly rich and solid. Audio Transfer Review: The 2.0 soundtrack conveys the dialogue and music well, without detracting from the experience. Everything is clean and clear. While occasionally puzzling, Kihachiro Kawamoto's The Book of the Dead holds a quiet power over the viewer, and dazzles in the beauty of its design and puppetry. The disc is serviceable but totally bare bones.